Danish model Maja Krag was born 1995 in Copenhagen. She was spotted by Bente from Scoop Models in a department store. Thus she began her modeling career as child model at the age of 8. Her beautiful face, color of her eyes, plump lips and slim body evoke comparisons with Hollywood actress Angelina Jolie and supermodels Cindy Crawford, Ruslana Korshunova, Ashely Smith. There is something really alluring about her feature when she looks away from the camera. Her seductive, mischievous look combined with an outstanding physique make her someone who has the potential to become a modelling star. Maja Krag looks gorgeous no matter what she advertises – a bikini, lingerie or formal gown. American silent cinema actress Colleen Moore was born on August 19, 1899, in Port Huron, Michigan. The list of movies where the actress played consists of more than 60 films. But Colleen has also become famous for her luxurious jewelry dollhouse Fairy Castle. The passion for doll houses was inspired by her father Charles Morrison. In her childhood the girl owned seven doll houses, constructed by her father. 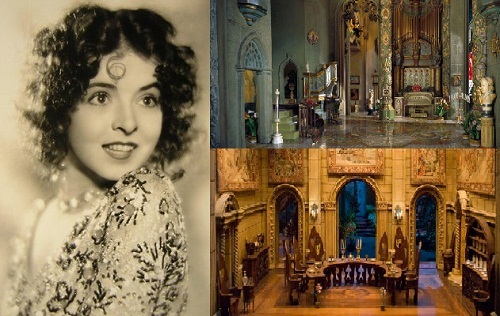 The first doll house with detailed miniature furniture was built from a cigar box, the actress wrote in her autobiography “Silent Star”, in 1968. Charles Morrison encouraged 29-year-old Colleen for creating her own jewelry doll house. And the Hollywood actress used all resources to create an amazing doll house of large proportions. It took Moore 7 years, more than 700 craftsmen – architects, designers, jewelers, artists to make her dream come true. American model and actress Carolyn Murphy has become an iconic American face. Carolyn Murphy was born on August 11, 1973 in Panama City, Florida. At a young age she worked as a waitress at the beach cafe. When Carolyn Murphy was 16 years old, her mother enrolled her in modeling school. The girl was involved in the shooting in Florida, then in Paris and Japan. In 1991, after graduating from high school, Carolyn Murphy moved to New York where she attended the University of Virginia. Meanwhile, in her free time, she moonlighted as a model. In New York, Carolyn was noticed by scout agency «Women Model Management». In the early 90s Murphy participated in advertising campaigns of such brands as Missoni, Et Vous, and Gucci.